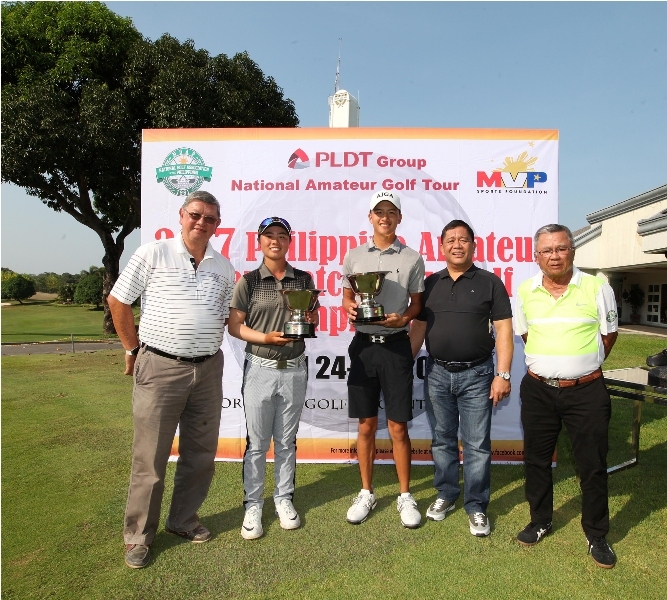 Peter Tyler Po (center) and Yuka Saso (second from left) hold their trophies as they pose with (from left) Orchard’s Conrad Benitez, NGAP director Rolly Romero and NGAP president Caloy Coscolluela Jr. after topping the Philippine Amateur Open Match Play crowns at Orchard’s Player course in Dasmariñas, Cavite last Friday. Sacred Heart School-Ateneo de Cebu student Peter Tyler Po and Yuka Saso both fought back from one-hole deficits after the morning play as they dominated the final 18 holes, pulling off 4&3 and 3&2 victories over Jolo Magcalayo and Harmie Constantino, respectively, to crown themselves the 2017 Philippine Amateur Open Match Play champions at the Orchard’s Player course in Dasmariñas, Cavite Friday. The ninth-ranked Po came out smoking at resumption of the grueling 36-hole duel in scorching heat, birdying and taking Nos. 3, 6 and 11 to wrest control then finished off his second-seeded rival with a par on the 15th to wrap up the match and record the biggest win of his young golfing career. 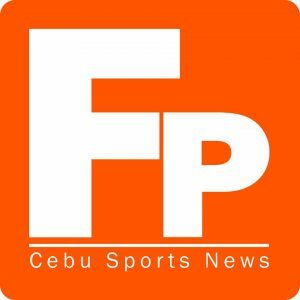 The victory capped the Cebuano’s remarkable campaign in the country’s premier match play event sponsored by the MVP Sports Foundation. He humbled top seed Rupert Zaragosa in the quarters then repulsed last year’s champion Noel Langamin in the Final Four. Magcalayo, who dominated Luis Castro in the semis, failed to match Po’s fiery afternoon charge with the latter squaring off the match with a birdie on No. 3, the 21st hole, moving 1-up with another birdie on No. 6 and posting a two-hole lead with a double-bogey on the ninth as Magcalayo dropped three strokes on the par-5 hole. Po then went 4-up with a par and a birdie to start the final nine but Magcalayo pounced on the former’s double-bogey mishap on No. 13 to close within three, only to yield another hole – the match and the championship – with a bogey on No. 15. In women’s final of the event organized and conducted by the National Golf Association of the Philippines, Saso drew level with a birdie on the 19th hole (No. 1), and took two of the next three holes, bogeyed No. 9 but won Nos. 32nd and 33rd holes then matched Constantino’s par on the 34th to clinch the victory and complete a sweep of the country’s major amateur championships after scoring a record 13-shot romp in last week’s Phl Am Strokeplay. Meanwhile, the NGAP has cancelled the Phl Junior Match Play set next week. The 16-year-old Saso, who eased out Kayla Nocum in the semis, also bagged the gold medal in the third World Junior Girls Championship in Canada late last year while powering the Philippines, with Constantino, who beat Kristine Torralba in the Final Four, and Sofia Legaspi, to the team championship. Langamin took third place with a 3&2 win over Castro, while Nocum routed Torralba, 4&3, to clinch third place honors in the women’s side of the event held as part of the PLDT Group National Amateur Golf Tour and backed by Cignal and Metro Pacific Investment.